These savory corn cakes are easy to make and will be a perfect side to any southwest meal. We even ate them for breakfast! Today, I’m excited to tell you about another friend’s book — The New Southwest. The book is written by Meagan Micozzi of Scarletta Bakes (<–that’s my “a day in the life” feature of her — if you want to head to her site, click this link). Meagan starts by going through the basic ingredients of southwestern cooking so that you’re well-acquainted with everything and there are no surprises. This section of the book will make sure you have the essential ingredients and tools to create any recipe in this book. Then she delves into building block recipes: Salsas, sauces, tortillas, fry bread, condiments and more. Then comes more deliciousness — for every meal of the day! Breakfasts include Mushroom and Leek Migas, Sweet Glazed Avocado Doughnuts, and Caramel Soaked Mexican Chocolate Pancakes. 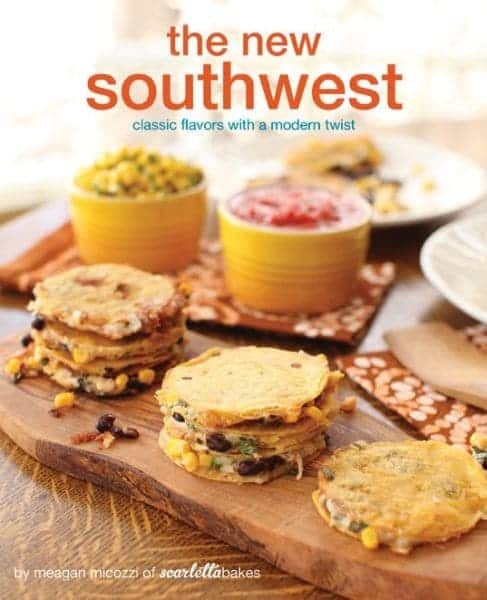 She covers some mouth-watering southwestern beverages before moving on to appetizers and snacks where I bookmarked Black Bean and Corn Quesaditas (on the cover! ), Spiced Snack Mix, and Savory Baked Pumpkin Flautas. There is a section on breads and then you’ll find these Savory Corn Cakes tucked in with other great side dishes. Then she moves on to main courses, things to be made on the grill (I’m starting to forget what the grill is, but I have faith the weather will get warm eventually), then desserts and some extras at the end for that extra special meal or occasion. There is definitely something for everyone in this book. 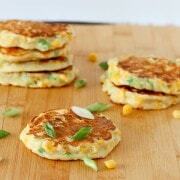 I’m so glad I chose these corn cakes as my first recipe to try out from Meagan’s book. 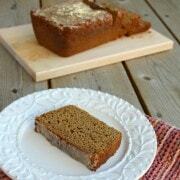 They are so good and quickly became a favorite. The crispy corn tucked away in the soft cakes with the flavorful green onions make these a perfect side dish or even a breakfast! I hope you love them as much as we did. In a separate bowl, whisk the milk, sour cream, and egg together. 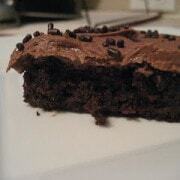 Whisk the wet ingredients into the dry ingredients, mixing just until you have a smooth, uniform batter. Fold in the corn and green onions. Heat 1 tablespoon oil in a heavy-bottomed skillet over medium heat (assuming you will be frying these corn cakes in batches, I recommend adding approximately 1 tablespoon of oil to your pan before cooking each batch). Using 1/4 cup measure, portion out 3 or 4 corn cakes into the skillet. 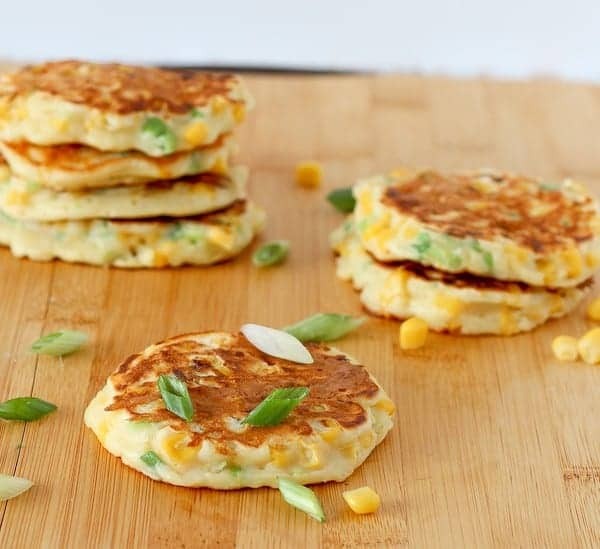 Fry corn cakes for approximately 3 minutes on the first side, until air holes appear across the top of each corn cake, and their shapes are set and matte colored. Flip and cook 3 to 4 more minutes, until corn cakes are cooked through. Serve immediately. Continue cooking batches of corn cakes until all the batter is used. Order the book and have it in time for Cinco de Mayo! Disclosure: I was provided a copy of the book to review at no charge but was not compensated for my review. All opinions are my own as always. Post contains an affiliate link. black bean burrito bowls – I LOVE THEM! I love stacked enchiladas with a fried egg on top! Can I choose that recipe as my new favorite? My favorite Southwestern- inspired meals is quesadillas made with sauteed greens from my CSA box. Anything that accompanies black beans and corn tortillas! Hands down, tamales! My favorite are the green corn style, which are delicous. Shrimp tacos with tomatillo-avocado salsa with soft tortillas! So delish. I totally bought this cookbook a few months back and adore it! 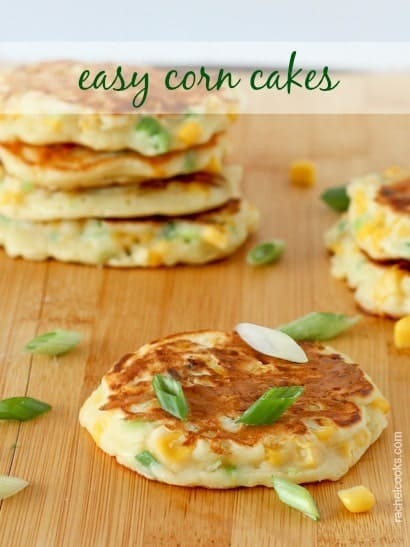 I’m a sucker for corn cakes, and these look perfect! I’ve got a big crush on black bean and corn salsa these days. Im not sure if this is considered southwestern, but i loveeee enchiladas! Guacamole for sure!!! I love cilantro in anything. One of my favorite foods (and I only have the energy to make the once a year) are tamales. YUM! Corn and cheddar quesadillas are probably my favorite! i love black bean quesadillas! I like anything with black beans. These corn cakes look awesome and I know my family would love them. I love all things Southwest food related – my most recent is stuffed peppers with savory scones! any and all of it…i love those flavors. 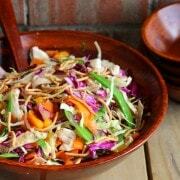 I like summer food using fresh ingredients from the garden. Salsas, shrimp stuffed peppers, anything with corn!! I like anything with corn tortillas & black beans! Anything southwest is awesome…I love my bean burritos with sour cream poblano sauce! Anything with black beans….or rice! Fried chicken is my favorite. I love SW inspired food – especially capirotada. It depends on the season…..chicken tortilla soup in the cool months, corn and black bean salad in the summer, fresh salsa in the late summer, corn cakes anytime, pickled jalapeños on any sandwich (except pbj), guacamole anytime…I love it all. Love tamales…. a flavorful chili… a picked from the garden salsa fresca…. limes and cilantro make my tastebuds happy! Fajitas, tacos, salsa, tortilla soup all homemade favorites. I love southwestern-style quesadillas with bacon! Definitely street tacos with grilled chicken, fresh, salsa, cilantro, etc! I love tamales , corn cakes and guacamole ! 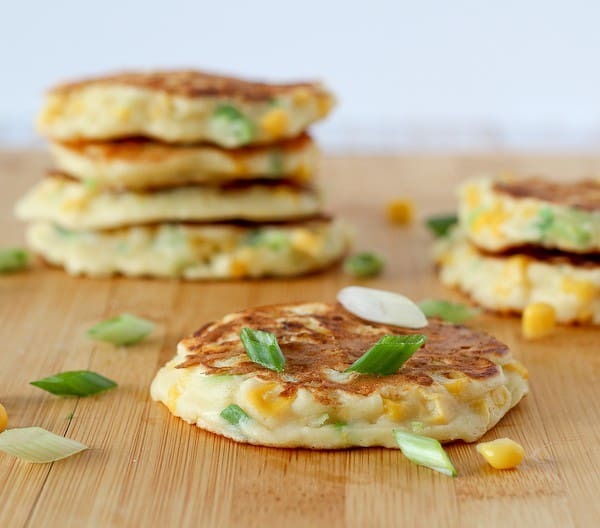 I absolutely love Mexican food and of course these savory corn cakes. I love tacos and salsa!!! If black beans and chipotle are involved, I’m in! Those corn cakes look like they could become my favorites, but currently my favorites are chipotle shrimp posole and chiles rellenos. Grew up on Tex Mex – could eat it daily. I especially like dishes with chili con queso, beans, guacamole. I like it all. Beans, corn, cilantro, lime, salsa whats not to like. My favorite southwestern inspired food is fajitas although those corn cakes look delicious. Possole wins hands down. Especially if eaten with loved ones in a resturant in Old Albequrque. Oh my goodness was that an eye opener for a person who grew up on the rather bland midwestern meat and potatoes. The good news is I can almost replicate it. Almost. May have to do a another road trip to New Mexico to get it right. Would love to add the cookbook to my collection. Anything with black beans, lime and cilantro gets my vote!! I like anything southwestern. It’s my favorite kind of food.